What does it take to win? 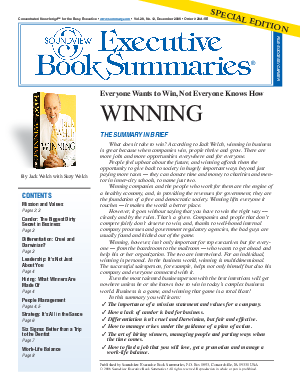 According to Jack Welch, winning in business is great because when companies win, people thrive and grow. There are more jobs and more opportunities everywhere and for everyone. People feel upbeat about the future, and winning affords them the opportunity to give back to society in hugely important ways beyond just paying more taxes — they can donate time and money to charities and mentor in inner-city schools, to name just two. However, it goes without saying that you have to win the right way ––cleanly and by the rules. That’s a given. Companies and people that don’t compete fairly don’t deserve to win, and, thanks to well-honed internal company processes and government regulatory agencies, the bad guys are usually found and kicked out of the game. The importance of a mission statement and values for a company. How a lack of candor is bad for business. Differentiation isn’t cruel and Darwinian, but fair and effective. How to manage crises under the guidance of a plan of action. The art of hiring winners, managing people and parting ways when the time comes. How to find a job that you will love, get a promotion and manage a work-life balance.